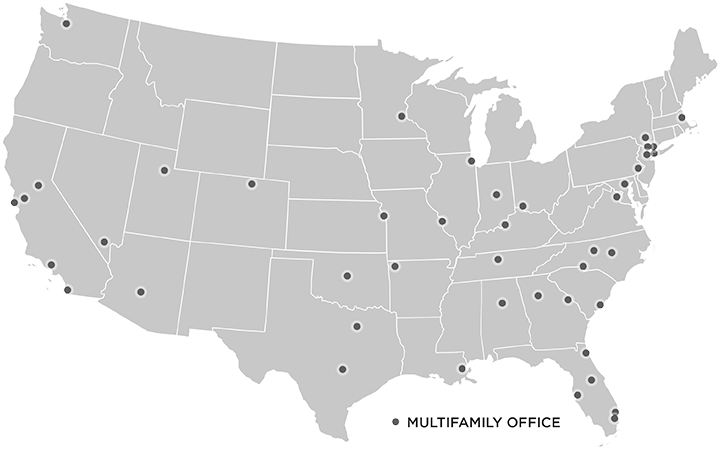 Cushman & Wakefield’s Multifamily Advisory Group creates opportunities for the marketplace. We deliver investment advice, transaction execution, and market information to owners and investors engaged in buying, selling, financing and developing multifamily real estate. Our clients include institutional and private investors, as well as developers. Our group takes a progressive approach to the strategic services we provide to our clients. Our full-service capabilities combine global and local knowledge to deliver tailored solutions unique to each client. We assist owners, investors, and developers in creating optimal custom strategies, and achieving maximum value for their multifamily assets. Clients get exhaustive bid options from the buying public and investors get far-reaching deal inventory. 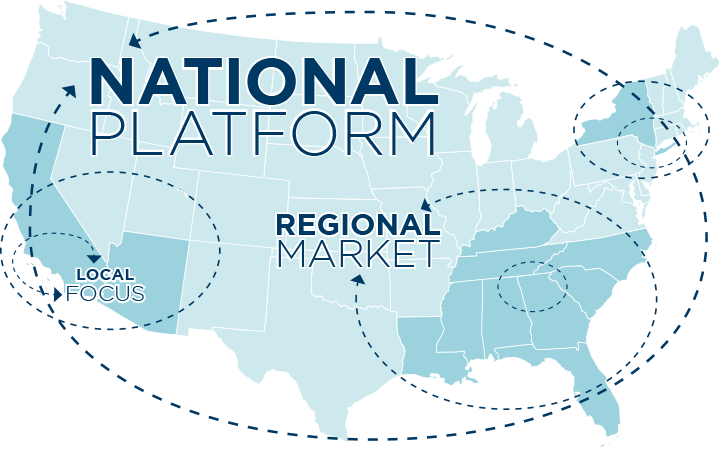 Spanning the United States allows us to employ a holistic approach, enabling capital to flow from region to region, not just across a single city. 2001: Cushman & Wakefield acquires The Apartment Group. March: Acquiring The Apartment Group, founded in 1992, allowed Cushman & Wakefield to establish the flagship office of its new Multifamily Brokerage Services division in Atlanta, GA.
2014: Cushman & Wakefield acquires Massey Knakal. December: Cushman & Wakefield acquires Massey Knakal Realty Services, a firm known for dominating mid-sized office, retail, and multifamily sales in the New York Tri-State region. 2015: DTZ merges with Cushman & Wakefield. September: DTZ completes acquisition of Cushman & Wakefield to create one of the world’s largest commercial real estate firms. The newly combined company has $5 billion in revenue. 2016: Cushman & Wakefield continues its aggressive growth strategy with key acquisitions and recruits. June: Cushman & Wakefield acquires MHA, founded in 2002, instantly creating a new regional powerhouse with the #1 market share across the Southeast. July: Cushman & Wakefield recruits Robert Given from CBRE, adding his highly successful Florida team to the multifamily practice. October: Cushman & Wakefield recruits the market-dominant New York Capital Markets team led by Doug Harmon and Adam Spies. 2018: Cushman & Wakefield maintains its proactive growth in the Central and Midwest regions. April: Travis Prince is recruited from Colliers International to lead the new national Student Housing team. August: Cushman & Wakefield adds dynamic multifamily investment sales team to Denver office. September: Cushman & Wakefield acquires Chicago-based KIG CRE, to strengthen the Midwest multifamily presence with the firm’s data-driven approach. November: Cushman & Wakefield acquires Tikijian Associates, a multifamily firm with leading market share in Indianapolis. Our solutions are designed to maximize each client’s objectives according to their unique situations and criteria, and encompass all transaction types. Cushman & Wakefield provides Capital Markets expertise and services through every stage of the acquisition and sales processes, helping clients meet strategic, operational, and financial goals for their real estate investments. Through the application of advanced strategies and funding mechanisms, we maximize the value of our clients’ real estate holdings. They benefit from both our global footprint and local market expertise, access to the most aggressive capital, and combined experience of more than 350 brokerage professionals in all major markets throughout the Americas. Global real estate owners and investors look to Cushman & Wakefield’s expertise to help them meet strategic, operational, and financial goals for their investments. We deliver customized strategies and solutions, experience in all property types, and offer unparalleled resources for investor targeting through our global footprint and access to both local and international capital. With an enhanced ability to identify and articulate exclusive opportunities, we provide creative investment ideas that maximize returns.